What would be the most expensive way to fill a size 11 shoebox (e.g. with 64 GB MicroSD cards all full of legally purchased music)? Randall Munroe explains, as he runs through the candidates– from diamonds to Lucy in the Sky with Diamonds– at What If? 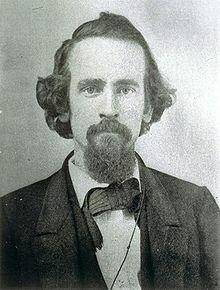 As we ponder pricing, we might might send simple birthday greetings to Henry George; he was born on this date in 1839. A writer, politician and political economist, George is best remembered for Progress and Poverty, published in 1879, which treats inequality and the cyclic nature of industrialized economies, and proposes the use of a land value tax (AKA a “single tax” on real estate) as a remedy– an economic philosophy known as Georgism, the main tenet of which is that, while individuals should own what they create, everything found in nature, most importantly the value of land, belongs equally to all mankind. It was George’s work that inspired Elizabeth Magie to created The Landlord’s Game in 1904 to demonstrate his theories; ironically, it was Magie’s board game that became (as recently noted here and here) the basis for Monopoly. In 1977, Joseph Stiglitz showed that under certain conditions, spending by the government on public goods will increase aggregate land rents/returns by the same amount. Stiglitz’s findings were dubbed “the Henry George Theorem,” as they illustrate a situation in which Henry George’s “single tax” is not only efficient, it is the only tax necessary to finance public expenditures.